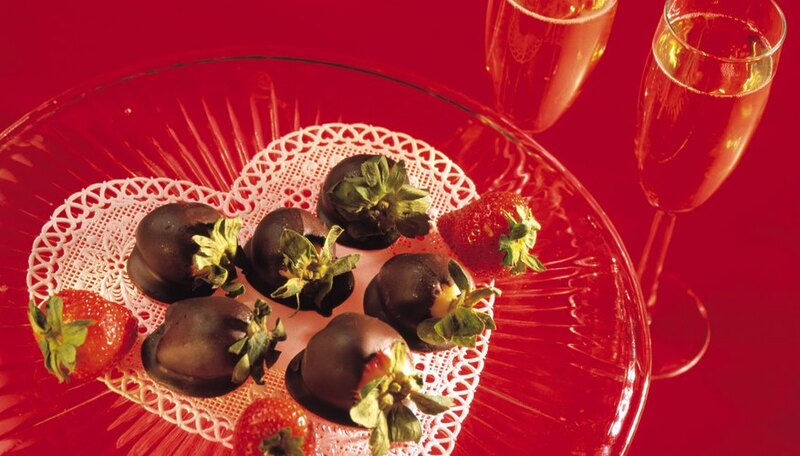 Valentine's Day is often a favorite holiday for couples who enjoy romance. There are many ways to celebrate the day, ranging from exchanging thoughtful gifts to decorating the home with heart-shaped decor. Making a home-cooked Valentine's Day dinner is a special way to commemorate the holiday and is fairly easy to accomplish. In addition to creating all types of delicious food, setting a romantic table amplifies the entire meal experience. Table decorations do not have to be elaborate or expensive to be beautiful. With a little time and attention to detail, a romantic Valentine's Day home-cooked meal becomes a special occasion to remember for years to come. Decorate your table for a romantic and elegant Valentine's Day dinner. Layering linens adds texture, color and pattern to the Valentine's Day tablescape. To enhance the table, layer a simple white tablecloth with an overlay of intricate lace, sheer organza or tulle in tones of red. Fabric remnants are fairly easy to find at fabric stores and are a resourceful way to add visual interest to a table. Adding embroidered solid or patterned velvet placemats, long, damask-trimmed table runners and heart-shaped, folded cloth napkins are additional ways to amplify the Valentine's Day theme and create a stylish table to serve as the backdrop for all the other subsequent layers of design. Adding a centerpiece to the middle of the table gives the Valentine's Day tablescape a focal point and anchors the entire design. For an elegant touch, choose flower arrangements using only one type of flower and color. Flowers such as roses or carnations are quintessential choices for a Valentine's Day bouquet. Cutting the stems short gives the centerpiece a visual height that is conducive to conversation, and placing the arrangement in a silver-toned vessel adds a stylish appearance as well. For an added element of romance, scatter rose petal leaves around the base of the flowers and run them down the table runner for a romantic dinner decoration that enhances the entire tablescape. Creating a romantic table setting requires many elements, including lighting. Candles add the perfect ambient light to any romantic occasion and are especially appropriate for a Valentine's Day tablescape. For a symmetrical, formal design, place a floating candle in a low, flat, heat-proof decorative bowl filled with decorative stone beads, and place one of these bowls on either side of the centerpiece. Adding a row of three tea lights in shimmering, red candle holders on the right and left side of the floral centerpiece is another way to add soft light and visual interest to the table design. Candles are a simple way to create a romantic mood for any occasion, which makes them a necessity for any Valentine's Day table. Filling an empty plate with a special decorative element adds a festive touch to the romantic table settings. Using elegant gift wrap and a fabric bow, place a special wrapped item, such as a piece of jewelry, on the dinner plate as an unexpected surprise. Place a single rose tied with a satin bow in the center of a dinner plate or fill a colorful Chinese take-out container with candy decorated with a brightly colored, tissue-paper bow at the head of the dinner plate as a decoration and take-home gift as well. Love is often in the details, so adding a few special decorative elements to the Valentine's Day tablescape creates a memorable romantic holiday. Mosher, Amy. "Romantic Valentine's Day Decorating Ideas for a Home Cooked Dinner." Dating Tips - Match.com, https://datingtips.match.com/romantic-valentines-day-decorating-ideas-home-cooked-dinner-10066393.html. Accessed 23 April 2019.